William Wilberforce’s journey to faith was not in isolation. He had the good fortune to be helped by Isaac Milner, a rare genius and physical giant of a man who, though not personally committed to Christianity, was a theologian in his own right, well equipped to explain and defend the great doctrines of Christianity which he respected. 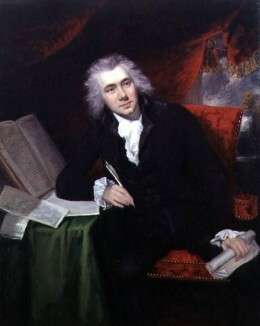 On a voyage across the English Channel and through France, they read a book titled The Rise and Progress of Religion in the Soul, of which Milner declared to Wilberforce, “It is one of the best books ever written” (47). Together they read, examined, discussed and reflected on its contents (what one would give to listen in on their conversations! ), and the wheels of their souls began turning. Before long, Wilberforce, age 26, put his faith in Christ. Shaken out of his carefree, pleasure-seeking attitude to life by his newfound faith, Wilberforce was at first harsh with himself. He resolved to eradicate his vices and replace them with virtuous habits, even making a list of the number of times he failed or prevailed in each vice or virtue each day. What floored me, however, was the agreement he entered into with his friend Isaac Milner to, in their own words, “exercise the invaluable practice of telling each other what each party believes to be the other’s chief faults and infirmities” (67). 1) As seen above, friends can be candid with one another about the other’s “faults and infirmities.” This requires not only a close friendship but strength of character, for it entails humility, candor, and above all, genuine love, which will guard against mean-spiritedness and over-sensitivity. 2) The other is reading books together. A person reading alone is a happy sight; but when you see two friends reading together, you know something special is taking place. There are few pleasures like going through a good book with a kindred spirit. Not only do you gain a deeper understanding through discussion as well as another perspective, but you also gain a more intimate knowledge of your friend.